Though we don’t have the gastronomic credentials of say, Anthony Bourdain or Sandor Katz, we’ve always had a vested interest in food (primarily eating it, but we’ve have been known to dabble in its creation). 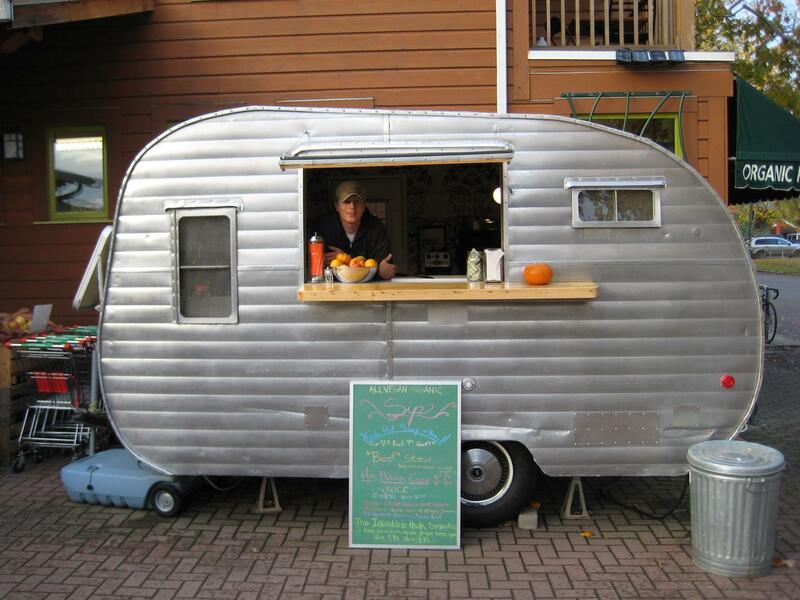 Thus, to disseminate our inherently valuable thoughts on food we’re creating “The Food Cart”, a recurring section of Busk devoted to all things culinary. Today’s piece addresses a recent obsession of Stephen Leo (esteemed Busk editor) and mine: Vegemite. 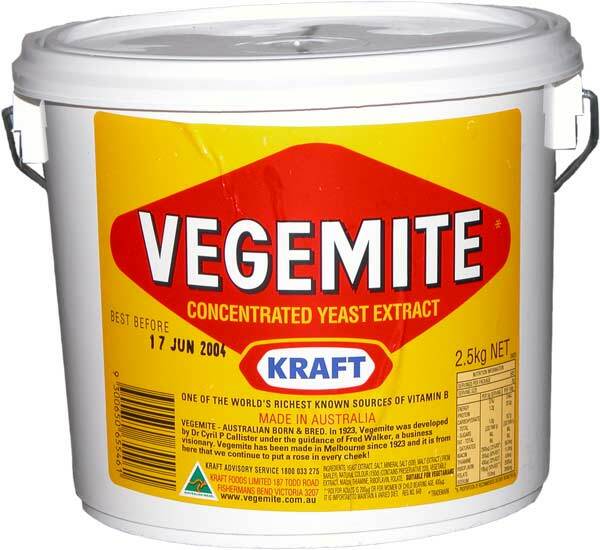 Vegemite is a savory yeast extract spread popular in Australia. I was first introduced to Vegemite earlier this year by my roommate Matt. Matt has consistently been the purveyor of things interesting and strange in my home. Early in the year he introduced me to Kombucha, a fermented tea drink that includes the mucus like leftovers of a bacterial yeast colony in its composition. I was immediately taken by the tonic. Yet, after realizing it was only sold at “artisan” rates at establishments like Whole Foods, I decided the only way to enjoy it would be to brew my own. (Even now when I drink store bought Kombucha I feel like I’m ingesting the absurd amount of money I spent on it). Next Matt introduced me to Goddess salad dressing. This admittedly, was a bit less exotic. Still, it was something I hadn’t tried before, thus leading to one of the generally three week long food obsessions to which I am prone. Goddess itself is a savory dressing composed primarily of Tahini and soy sauce. Thus I doused anything that even tended toward the savory with the stuff: rice, beans, tofu, sautéed kale. Though I quickly became a Goddess worshipper, my obsession was never quite as strong as Matt’s. To this day Matt still indulges in what he calls “sauce sandwiches”. I’d post a recipe, but I think it may be more expedient to include the ingredients and execution here. To make a sauce sandwich, pour Goddess on a tortilla, roll it up, and, if you feel so inclined, eat it. I digress. Let us to return to our intended subject: Vegemite. For those who haven’t had the pleasure, Vegemite is a tar-like spread composed of yeast left over from the beer brewing process. It’s very salty and has an umami flavor vaguely reminiscent of beef bouillon. 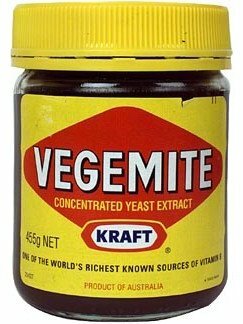 Though yeast spreads are enjoyed by peoples the world over (including England and New Zealand, who both refer to their spreads as Marmite), Vegemite is unique to the kangaroo riding, twenty-two foot wave surfing people of Australia. In short, its an extreme tasting spread designed to complement an extreme lifestyle. Vegemite is most commonly enjoyed on toast with a bit of butter or margarine. Depending on the experience of the eater, it is to be used sparingly or ultra-sparingly. Early this year I happened to see Vegemite in Matt’s cupboard. We had a few passing words on it, I tried a bit on my finger and we went on with our lives. Over the next couple of months I’d see it, but wouldn’t give it a second thought. It seemed too odd a thing for my attention and I felt at a distinct disadvantage not being Australian. I was even further deterred by the fact that Matt rarely touched the stuff either. And so the Vegemite sat, lonely and bored, far from Australia’s sunny shores and vast stretches of wild outback plain, with no occupation other than the reading of labels of spices and spreads in constant flux around it. Then Stephen Leo tried it. Already a toast fanatic, bored with the limited choices of spreads, he slathered the pungent, yeasty roofing tar on a slice of rye. He ranted, he raved, he inspired in me an urge to imitate, because, as evidenced by my adoption of Matt’s culinary interests, I rarely develop original fixations. So I tried some as well. First on toast. Then on tortillas. Next on a sandwich with avocado and cheese. On crackers. In chili. In rice. From my finger. From a spoon. Before either of us realized it, Matt’s jar of Vegemite was spent. We needed to find more. I’d like to say we were primarily driven by our guilt over eating all of Matt’s Vegemite, but junkies do not have such noble concerns. We needed Vegemite, we needed a lot and we needed it soon. Following the council of our appetites, we decided the tiny 400 gram (roughly 6 ounces) jars wouldn’t do. We needed a giant yellow five-gallon bucket of the stuff if it was available. After scouring the internet for local options we realized it might be cheaper to buy Vegemite in bulk online. There we were able to locate 2.5 kilogram buckets at the relatively low price of 23 dollars. The provider was a website specializing in all things Australian. In the “most popular” section along with the Vegemite were small bags of Australian licorice, kangaroo jerky and Tim Tam biscuit cookies. Though I spent some time reviewing the wares, I realized Australian cuisine had little to offer me outside of Vegemite and the occasional “shrimp on the barbie”. A 2.5 kilogram bucket of Vegemite. A proper meal. Having survived the proverbial outback of online food shopping, we preceded to the checkout, looking to deliver our haul to Colorado. Now, as seldom as I find myself in internet purchase check outs (I generally do my shopping in person), I maintain a vague familiarity with their standard procedure: provide your credit card information, your current address for delivery and click “purchase”. This online retailer however, insisted that I complete one extra step. I was directed to review a list and locate a code that corresponded with my state of residence. Next, I had to add this number to the weight of my purchase, and then multiply it by the number of items I was purchasing. Ok, fine. I went ahead and performed the operations (with no great amount of ease) and continued to the final check out. Up to this point I had not once considered the fact that I was ordering goods from another country, never mind a country half the world away. The calculation I had just made was to determine the shipping rate to carry a 2.5 kilogram bucket of Vegemite to Colorado; to determine how much money would be needed to pay the truck driver carrying the Vegemite from the Kraft factory to the shoreline; how much would be needed to pay the Australian longshoreman, slaving in the hot sun to transport crates of Vegemite to freight ships bound for Hong Kong, London, New York. To get Vegemite to my doorstep, onto a butter knife, a piece of toast and then into my mouth would cost more than the Vegemite itself. I needed Vegemite, but I could not be persuaded to spend 48 dollars on a tub that would last us a month at best. I moped a bit. Under my breath I cursed shipping rates. I watched YouTube videos of Australian children taking large bites out of pieces of toast smattered in black. I shook enviously as they chanted the Vegemite jingle in a warbling soprano, a thin dark ring encircling their lips. Soon however, I began to take comfort in my self control. I was glad to find that my hunger could be tempered by fiscal reasonability; that despite having an addiction, I’d still have a place to live at the end of the month; that my teeth may be a bit whiter for my discretion. I’ll be frank. I have bought Vegemite since then. Stephen Leo and I settled for the 400 gram jar, and even deigned to pay 9 dollars for it. But our consumption has slowed and are both on our way to healthy recovery. If my roommate Matt ever asks you to try something, tell him, “no”. ill try anything matt offers me, usually only once, though….